PowerWorship supports the use of PowerPoint templates (.pot, .potx) as a means of applying background templates to generated slides. If you downloaded the additional templates for PowerWorship 3.1 and would like to use them with PowerWorship - extract the pw_templates.zip file to the PowerWorship installation root directory (e.g. C:\Program Files\PowerWorship 3.1). Please note, the additional templates (included in pw_templates.zip) are now installed by default with PowerWorship 3.2 (as of version 3.2.4). If you created one or more PowerPoint templates manually (or otherwise obtained additional PowerPoint templates) and would like to use them with PowerWorship - copy (or otherwise save) the templates (.pot and/or .potx files) to the PowerWorship templates directory and the templates will be available for selection when you relaunch PowerWorship. The PowerWorship templates directory is located at C:\Documents and Settings\All Users\Application Data\PowerWorship\pW3\Templates, by default - for PowerWorship 3.2.4 and later releases, or at C:\Program Files\PowerWorship 3.x\Templates, by default - for PowerWorship 3.2.3 and earlier releases. Select Edit menu > Settings to open the PowerWorship Settings and click the Select button (on the Slide Format tab) to open the template selection dialog where you can select a new template. 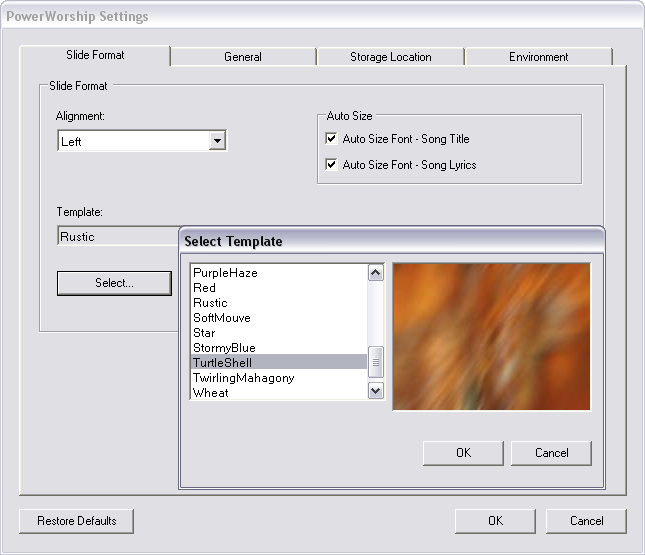 The selected template (as selected in the PowerWorship Settings) will be applied to all slides generated by PowerWorship except where there is an explicit override defined using the Background button in the main PowerWorship window. The Background button allows you to override the default template setting and you can optionally use multiple templates for a given song group. 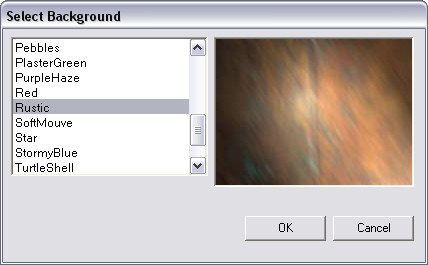 When the Background button is used, the selected background template is applied to ALL songs that immediately follow a given background entry (e.g. <Background:=My Template>) in the selected songs list. If multiple background entries are added to the selected songs list, each background will be applied to each song that follows a given background entry - up to the next background entry (if any) in the list. The recommended way to add new user-defined templates to PowerWorship is to copy (and rename) an existing template (e.g. one of the templates included with PowerWorship) and then edit the template (e.g. in PowerPoint) and change the background and then save it to the PowerWorship templates directory. This can be done either manually (e.g. by copying template files using Windows Explorer) or via the Save As... and Edit options in the PowerWorship Settings (Slide Format tab). The Save As... option (button) allows you to save a copy of the currently selected template under a new filename. The Edit button allows you to edit the currently selected template. When you click the Edit button, the currently selected template will be opened in Microsoft PowerPoint - for editing. This method of adding additional templates (by saving a copy of an existing template and then changing the background image, etc.) is the best way to avoid the application of potentially unwanted slide format options such as bulleted lists.